A four-day program, choice ingredients, award-winning wines, visiting cuisines, and famous Croatian and foreign chefs, together will create a rich program for the second edition of the Good Food Festival. Preparation of dishes typical for our region, tastings of regional wines, culinary workshops, programs such as ˝dinner with a famous chef˝, workshops on preparing Dubrovnik delicacies, unique menus in Dubrovnik restaurants, ˝Eat & Walk˝ culinary tours, the ˝Sweet Tooth Map˝ – a map for gourmands, presentations of the tourist attractions and gastronomy of the Spanish town of Gijon and the Slovenian region of Gorenjska, and other surprises will surely delight each and every visitor. 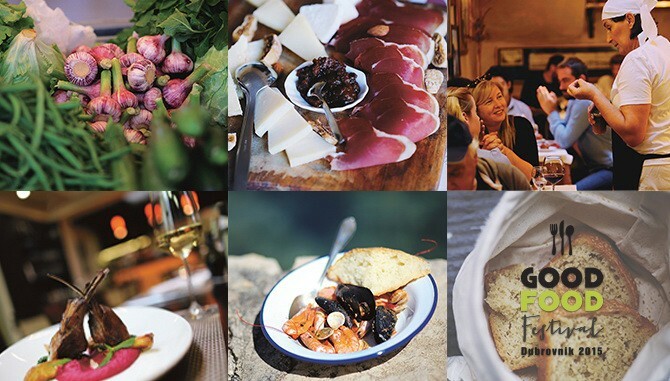 Dubrovnik Good Food Festival, a gastronomic treat for all lovers of good food, will be organized by the Dubrovnik Tourism Board in late October 2015. From October 22nd to 25th, thirty gastronomic events, together under the name Good Food Festival will enrich Dubrovnik’s overall program at the end of the first month of autumn and will most undoubtedly delight Dubrovnik’s visitors, just like last year’s first edition of the Good Food Festival.